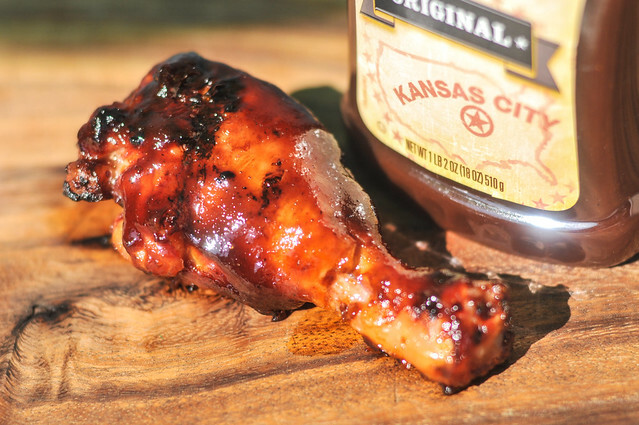 Bold, smoky, sweet, tart, and spicy, KC Masterpiece defines the common conception of barbecue sauce, but while its standard flavor won't let you down, it also probably won't impress. We're all gearing up for the big "official" start of grilling season this weekend, and I'll wager KC Masterpiece will be found grill side at many barbecues across the nation on Memorial Day. 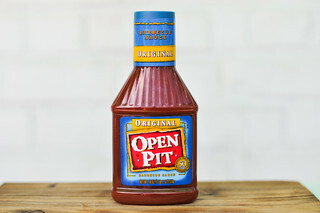 Such a staple of the supermarket and backyard, I thought it was a fitting time to give this ubiquitous barbecue sauce a proper review. This bottle was gifted to me from the folks at Kingsford, who actually own the KC Masterpiece brand, buying from its creator, Rich Davis, in 1986. Rich invited his popular 5-ingredient sauce in 1977 in Kansas City and it became the first sauce ever to win the "Best Sauce" award at the American Royal. 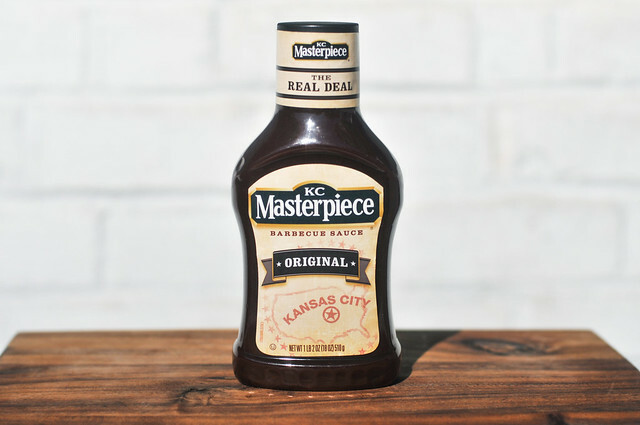 There are currently 7 different varieties of sauces in the KC Masterpiece line, spanning everything from Smoky Bourbon to Hickory Brown Sugar to Hot n' Spicy. Hope you like liquid smoke, because this sauce's smell delivers on it big time. The deep smokiness masks a lot of other aromas, but there's no mistaking the second heaviest hitter, molasses, which mixes nicely with a tomato base. There's a strong sweetness that hints at additional sugars other than molasses, but thats about all that can't be discerned thanks to the overpowering liquid smoke. 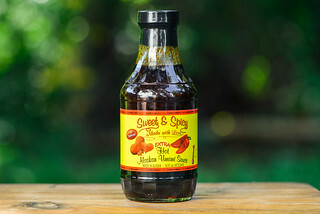 This sauce weighs in close to the top of the thickness scale—it falls in only a couple big globs off the spoon, but most of the sauce is left clinging. It has a dark brown color that renders it difficult to make out any spices, but I could see a couple black pepper specs here and there. It's also very smooth with a glossy sheen—most likely from the high fructose corn syrup. Man, this stuff is loaded up with sugar. The first taste is all sweetness, a mixture of corn syrup and molasses. As the sauce has time to settle on the tongue, a deep tomato flavor starts to make an appearance, quickly followed by the tang of vinegar, with a medium smokiness all the while. Seconds after the tang comes out, a bit of heat begins to tingle the tongue, which is then left as the final flavor that lingers after all the sauce is all gone. 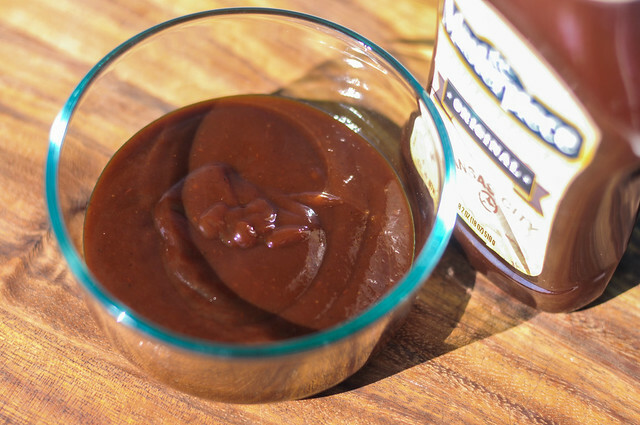 KC Masterpiece has been around for a while and it's probably not going anywhere, and for good reason—this is what people think barbecue sauce should be. It has a big bold flavor that's smoky, tart, spicy, and above all else, sweet. It's a ubiquitous barbecue flavor that I think is fairly balanced out of the jar, albeit a bit overstated. After being cooked though, it's entirely too sugary for my taste and the tang and spice that makes barbecue sauce so good, gets lost. All-in-all, it's an average sauce, which is what I would expect from a supermarket staple. Sure it's going to churn out beautifully coated chicken and glossy ribs, but what you gain in convenience and appearance, you lose in an standard flavor that won't upset, but also won't wow. High Fructose Corn Syrup! Eww Yuck! I'll pass on this sauce. WHY would you put High Fructose Corn Syrup in your product when you KNOW it causes diabetes. This is one of the worst additives to food on the planet. With the sugar and molasses, WHY does this recipe need it? This is disgusting. I didn't notice it until I got home. It went into the trash. WHY, WHY, WHY????? I was fixing a recipe that called for 16 oz of BBQ Sauce, so I purchased your KC Masterpiece "The American " Original kettle cooked that claims to have 18 oz in the bottle. When I went to measure out my 16 oz, I found that the brand new bottle only had 12 oz in it. What a rip. I guess you include the weight of the plastic bottle as part of the content weight. Sorry, but we don't cook the bottle. 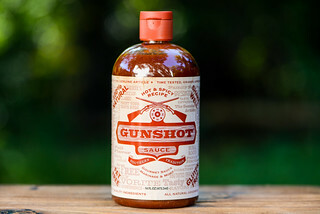 You're shorting your customers 6 oz of sauce. That's 3/4 of a cup in case you haven't figured that out. That's a lot of sauce to short your customers when they think they are getting 18 oz.